Some context: I'm currently packing for a weekend in West Virginia. Laundry is yet to be folded and my thrifted leather weekender bag is set out, empty, waiting to be filled with all of the essentials. I'm playing two shows at the Purple Fiddle for Art Spring -- the big Memorial Day art and music festival. I'm planning on consuming tons of great coffee, high vibe smoothies, and groovy music. Because Thomas, WV is so affordable it attracts lots of creatives, and some of the best around. You can pick up everything from original sculptures to silk art to hand wrought jewelry to ceramics. Pieces range from the delicately beautiful to the grotesque and odd. It's a trip and I love it. If you're going to Art Spring come say hi and check out my sets with Annabeth McNamara! This cake. You know how strawberries and champagne are friends? 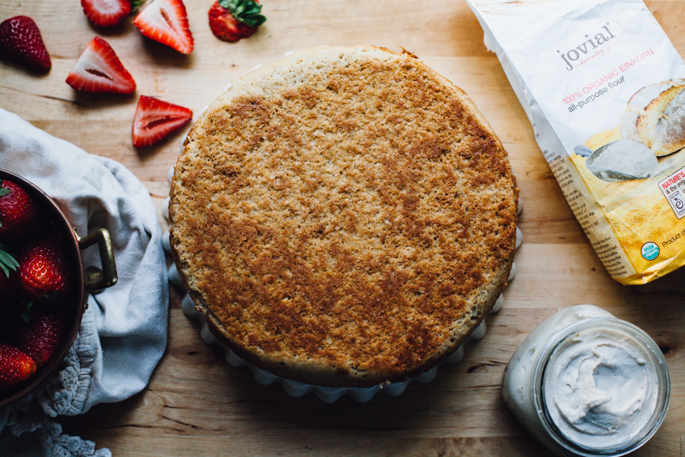 Well, this cake is a little riff on that concept with kombucha instead of booze. Not that I'm against booze. I'm just for kombucha. It adds some character to what is otherwise a perfectly nice vanilla cake. It's like dying a prep-school boy's hair blue. It's strange and beautiful and kickass all at the same time. I've made this lovely fresh berry confection with einkorn flour, which just so happens to be one of my favorite things. You might be aware that some wheat sensitive folks can eat spelt. I'm not one of them, but I can eat einkorn, the most ancient of all wheats; it's has a simpler genetic structure than spelt, and different gluten proteins. If you're non-celiac-wheat-sensitive you might want to try it. Actually, if you're ANYONE you'll want to try it! From a nutrition perspective: it's high in protein, B vitamins, iron and low in starch. From a gastronomic perspective: it has a pleasant, nutty, almost lemony flavor; the flour itself is soft and silky, and einkorn wheat berries are flavorful and wonderful as a substitute for Farro. I like using the flour in traditional quick wheat recipes that don't require a lot of kneading, stretching, or rising. The gluten proteins are weak in einkorn so it's unlikely to make a fabulous croissant. But for pitas, crackers, pizza dough, quick breads, pop overs, buns, cinnamon rolls... it's a gem. And of course it makes a fantastic, springy, moist cake! I came up with this frosting recipe months ago and put it on the back burner. Mostly because I make cake only rarely and didn't have the occasion or inclination to whip one up. Until now. Because this year strawberries are a dark, juicy, tantalizing red. And cake is a form of worship. And cake with genius vegan frosting is an offering to the gods. The berry gods, if they're out there. Thanks berry gods. You done us good. This post was sponsored by Jovial Foods! Thanks, Jovial! All opinions and words are my own. Preheat the oven to 350F. Grease a 9\" spring form pan with coconut oil or line with parchment paper (I find the parchment makes for an easier clean-up and removal from the pan, but the cake won\'t come out looking as perfectly pretty due to the folds in the paper. But hey maybe you\'re an origami wizard and can fold that paper nice and flat! Good for you!). In a large mixing bowl, sift together the einkorn flour, baking powder, baking soda, and sea salt. Add the psyllium to the bowl. In a separate medium mixing bowl, stir together the maple syrup, kombucha, almond milk, vanilla extract, and coconut oil. Add the wet mix to the dry mix and whisk gently to combine, removing lumps as you go. Take care to mix until just combined. Avoid popping too many of the air bubbles forming from the kombucha and sodas interacting. Pour the batter into the springform pan, scraping the bowl clean as best you can. Bake 45-50 minutes, until the cake is golden brown on top and a knife inserted in the center comes out clean. Cool a minimum of 20 minutes before releasing the springform. Remove the cake and place it on a cooling rack and let completely cool to room temperature before frosting, up to an hour. You can even make this cake the day before it\'s meant to be served to excellent effect. Once the cake is totally cool, flip the cake so that the bottom is facing up (this is just an aesthetic thing, but I think the bottom of the cake is flatter and better looking). Take a wide, sharp knife and slice the cake through the center to create your layers. Gently lift the top layer away using the knife or a spatula (or both of your hands, palms flat and facing up) and set it on a sheet of parchment paper set out on your work surface. Spoon out the frosting over the bottom layer and spread it out evenly with a spoon until you have a 1/4 inch layer of frosting. Layer 1 cup strawberry slices out evenly over the frosting. Gently pick up the top layer and lay it over top of the bottom layer. Frost as you like, or -- to get that frosting swirl -- place the remaining frosting in a pastry bag, snip of the end to your desired width, and pipe the frosting from the outside in towards the center of the cake. Top the cake with more halved strawberries. I like to pile them up in the center so you can see the frosting pattern. 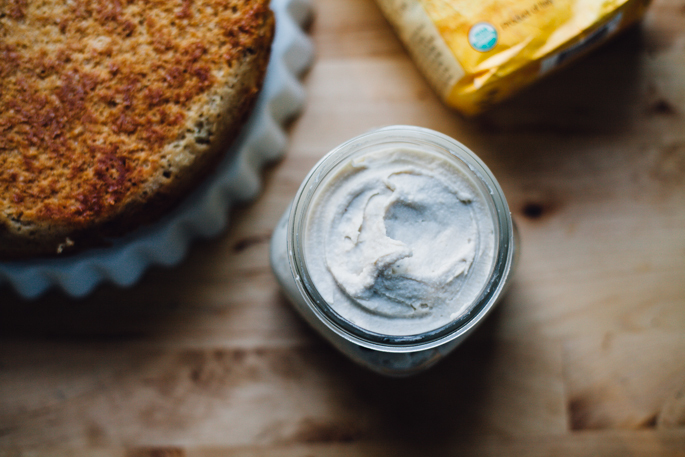 This frosting is made with all whole ingredients, requires no whipping or fancy gadgetry, and is spreadable, pipe-able, and perfectly easy. NOTE: prep time includes time frosting is cooling + time spent setting up in the fridge. Active prep is only 10-15 minutes. In a small sauce pot, combine the coconut cream, cashews, vanilla extract, maple syrup, coconut oil, and salt. Bring to a low simmer and keep at that heat for about 5 minutes. Remove from heat and let the ingredients set together in the ambient heat for 15 mins. Add everything to the bowl of a high powered blender and combine until you\'ve reached a completely smooth, creamy, liquid consistency. Remove the liquid frosting to a glass container with a lid and cool in the fridge for a minimum of 4 hours up to overnight (I find a good 8-12 hours in the fridge makes for a thick, spreadable frosting). When you're ready to frost, simply spoon and spread the frosting over whatever you like or add it to a pastry bag and pipe away!